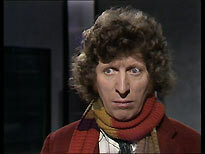 Genesis of the Daleks was the fourth story of Tom Baker's first season of Doctor Who. It was originally transmitted in March and April 1975, and it's a strong candidate for The Best Doctor Who Story Ever Made. It's certainly one of the fans' favourite stories, and its popularity is reflected in the number of times it's been repeated by the BBC (it was repeated in 1975, 1982, 1993 and 2000, sometimes complete, but as often as not in edited omnibus format). 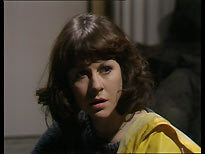 The story finds the Doctor and his two travelling companions, Sarah (Elisabeth Sladen) and Harry (Ian Marter), on the Daleks' home planet, Skaro. They have been sent there by the Time Lords, who want the Doctor to intervene at the very start of the Daleks' rise to power: to nip the problem in the bud, so to speak. The travellers arrive during a centuries-long war between two races: the Thals and the Kaleds (the story effectively re-writes the history of the Daleks that was established in the show's second story, The Daleks, in 1964). 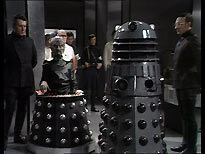 Here the Daleks are being developed by a crippled megalomaniac scientist, Davros (Michael Wisher), ostensibly as travel machines to house the Kaleds, after they mutate, due to the radiation effects of their war with the Thals. 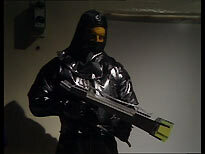 In reality he plans to turn the Daleks into ruthless killing machines, wiping the Thals off the face of the planet. 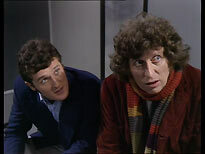 It's true that there's a bit too much running up and down corridors, or crawling through air vents, in the six-part story, but in most other respects Genesis of the Daleks is a remarkable story, with a strong moral core, well-developed ideas, and some of the best production values of the entire series. The Daleks are the focus of the story, but they appear only at the periphery, with no more than a handful of lines of dialogue. 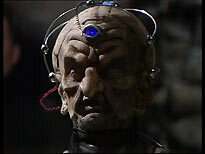 The real villains are Davros, and his sadistic left-hand man Nyder (a wonderful, sneering performance by Peter Miles). The story is superbly directed by David Maloney, one of the series' most talented contributors. He has a flair for the dramatic, and a very good eye for composition. He manages to keep the story rattling along at a breathless pace, even when Terry Nation's often routine plotting is working against him. One of the key strengths of this story is highlighted several times on the DVD, during the documentaries, and in passing during the commentary: Duncan Brown's magnificent lighting. Most BBC TV drama productions of this period have a characteristic look, where every square inch of the studio is blanketed in light. Indeed, two other stories from this season of Doctor Who follow this pattern, creating the suitably sterile environment seen in The Ark In Space and Revenge of the Cybermen. Genesis of the Daleks was shot with a painterly feel for light and shadow. It's not murky, though: everything you need to see is perfectly accentuated. This gives Genesis of the Daleks much of its atmosphere. If you didn't know better, and there weren't the tell-tale technical signs, you might think that the entire story was shot on film. I must admit that, until it was pointed out, it hadn't really occurred to me that this was an important factor in the success of the story, but watching it again with it in mind brings a new appreciation to its craft. The other thing I wanted to note is that, although Genesis of the Daleks is one of my favourite Doctor Who stories (which means I've seen it more times than I care to count), seeing it again for the first time on DVD made me realise that I'm far more familiar with some of the edited versions than I am of the story in its entirety. When Genesis of the Daleks was first repeated, as an eighty-five minute compilation, on the day after Boxing Day, 1975, I recorded the soundtrack onto cassette. I practically wore that tape out over the next couple of years. To this day I could probably re-assemble that version shot-for-shot. I was also very familiar with the BBC Records LP version of the story, which further condensed the story down to an hour, with added narration by Tom Baker (this version, which isn't nearly as successful, is still available on CD). Seeing the story again on DVD was full of little surprises: bits I'd forgotten, and things I'd never noticed before (thanks to the clarity of DVD, you can see that one of the things the Doctor removes from his pockets is the Honourable Member of to the Alpha Centauri Table Tennis Club card, a small in-joke first mentioned in Baker's debut story, Robot, for example). The two-disc set offers the six episodes of the story on one disc, with commentary tracks and production subtitles; and all the other bonus materials on the other. Picture quality is generally excellent. As usual, the show was recorded on 2" quad video, with 16mm film inserts for scenes shot on location (and, in this case, for scenes shot on film at Ealing Film Studios, because they were too difficult to mount at TV Centre). As usual, we're stuck with the telecine transfers made at the time, because the original film inserts weren't kept after the production was completed. Scenes shot on film inevitably have a soft-focus look to them compared to the crisp VT material. BBC film inserts are usually pretty grotty, too, because they weren't handled very carefully. 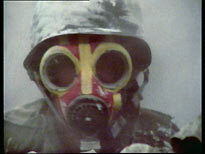 Typically they're showered with dirt, and often exhibit a flickery effect caused by the comparatively primitive telecine equipment in use at the time. Once again, the master tapes have been expertly re-conditioned by the Doctor Who Restoration Team. It's a cliché to say that they've breathed new life into them, but no exaggeration. Many of the improvements are subtle, and are only apparent when compared to the original recording (as seen on TV, and on the original VHS release). The film sequences have been re-graded. There are noticeable improvements to the colour saturation and fidelity. This also means that, with the studio sequences often looking much more like film than usual, thanks to Duncan Brown's lighting, the usual jarring changes from film to VT are much smoother than usual. The studio material is sharp, and nicely saturated, with good contrast and detail. There are one or two unavoidable minor glitches (the interference patterns caused by the bursts of machine-gun fire, for example), but even these have been tempered. If you doubt that the Restoration Team work miracles on the BBC's quad tapes, then you only have to compare the results with contemporary material that they haven't cleaned up. As it happens I was watching a 1979 BBC production released by another label just before the Genesis discs turned up, and it was in a very sorry state, with numerous drop-outs, line flashes, and entire sequences suffering from mis-tracking. It was a stark reminder of just how creaky thirty-year-old quad recordings can be. An account of the cleanup work undertaken for this story can be found at the Doctor Who Restoration Team website, here. Quad material is notoriously difficult to transfer to DVD, but the results here are very good indeed, certainly comparable to the best of the four part 70s stories released on disc. The average bit-rate appears to be 7.19Mb/sec, and is very adaptive, with high peaks, and low dips. There's a bit of softness to the image in one or two spots, but thankfully little sign of the noise-pumping and MPEG-compression artefacts that marred earlier discs like Robots of Death and The Talons of Weng-Chiang. The audio for the story is standard BBC mono, which is to say that it's of a pretty high standard, with good dynamic range, and no glaringly obvious flaws. Again, much of the restoration work (adjusting levels, re-cueing spot effects, etc), is virtually invisible to the home viewer: you'd have to listen to the original version side-by-side to appreciate the tweaks made to bring it up to such a high standard. The episodes and the bonus material has optional English subtitles, but, once again, there are no subtitles for the commentary track. Frankly, you're not missing much this time. Each of the six episodes is accompanied by a commentary track. 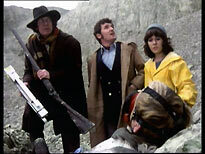 The contributors are (in various combinations) stars Tom Baker and Elisabeth Sladen, director David Maloney, and guest star Peter Miles (a veteran Doctor Who performer who also appeared in two Jon Pertwee stories). I have to say that I was a little disappointed with these tracks. They're rather hesitant, and there are often long passages where nothing insightful is revealed. Baker occasionally chips in something amusing, often a disparaging comment about his own performance, but usually seems engrossed in what he's watching. Things pick up a bit towards the end, but you'll need some perseverance to get there. On other Doctor Who discs the contributors are jollied along by a knowledgeable moderator, and one was desperately required here. Baker is a great source of anecdotes, and there were sparks here that needed kindling. A bit of banter between Baker and a moderator who knows how to get the best out of Baker's repertoire might have enlivened things considerably. The other bonus feature on disc one is the option to view Production Notes subtitles while the story plays. Usually these are a mine of trivia and information, even for a reasonably dedicated fan. This time, though, they didn't seem as interesting as usual, and often skimped on information that's routinely been offered in the past (the names of the un-credited cast and crew members, for example). Often you feel that a great deal of in-depth research has been undertaken to create the Production Notes subtitles, but the ones here don't really give that impression. They lean rather heavily on pointing out the differences between the early versions of the script, and the transmitted version: information that's better conveyed in the superb book Doctor Who - The Scripts - Tom Baker 1974/5. The most interesting information was explaining that the story's cliff-hanger endings were not usually as they appeared in the scripts. The second disc features two documentaries that were especially made for this DVD set: Genesis of a Classic (62m) and The Dalek Tapes (53m). Genesis of a Classic is a detailed examination of Genesis of the Daleks, from its origins as a re-heated and rejected Terry Nation story, to the finished programme. 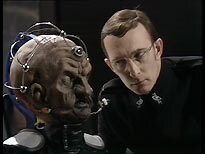 All aspects of the production are touched on, including the design and creation of Davros. It features interviews with an astonishing array of contributors, including guest stars James Garbutt, Dennis Chinnery and, via archive footage from a Reeltime Pictures interview, the late Michael Wisher. Often the contributors have little more than a minute or two of screen time: Doctor Who fans are certainly getting value for money! It's here that Duncan Brown's lighting is discussed as being a big factor in the story's success, and he is interviewed to explain how he tackled the project. Finding an attractive way of presenting interviewees in Doctor Who DVD documentaries has been a bit hit-or-miss in the past. Sometimes the backgrounds have been so garish that they have distracted from what the interviewee is saying. Here the contributors are sharply lit against black, and placed alongside appropriate grey-and-black images from the story that drift very, very slowly, subliminally adding momentum. It's a very clean, professional look, and works very nicely indeed. Genesis of a Classic is well-structured, and seems to be the ideal length for a documentary of this type. 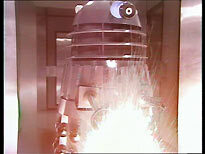 However, its coherence and gravitas is undermined somewhat by being punctuated by segments titled Teach Yourself "Dalek" in Six Easy Lessons, which have Dalek voice artiste Roy Skelton re-creating Dalek dialogue from the story, and demonstrating how the Dalek voices change to reflect different circumstances. Apart from demonstrating how similar his untreated Dalek voices are to his voice for Zippy in the kids' series Rainbow, these segments seem somewhat superfluous, and certainly at odds with the generally sensible tone of the rest of the documentary (Tom Baker sections withstanding). Genesis of a Classic is in 16:9 format, with 4:3 clips respectfully presented in their original format, with bars at the sides. The Dalek Tapes is a beginner's guide to the creatures, using clips from various Dalek stories, mixed with comments from various cast and crew members (including directors Ken Grieve, Timothy Combe Graeme Harper and Richard Martin). 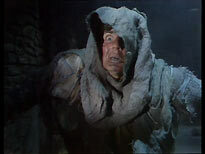 Linking narration is by Terry Malloy, who, as you probably know, took over the role of Davros in 1984. The Dalek Tapes has a nice, clever linking conceit, which helps structure the way its narrative unspools. It's in 16:9 format, with some clips presented within the 16:9 frame in 4:3 format, where appropriate. Clips that provide texture for the narrative, rather than illustrate a particular point, have been cropped and treated quite successfully and artfully. Long-term fans of the series, who will know the story the documentary is telling already, are rewarded with brief behind-the-scenes clips from stories like Death To The Daleks and Revelation of the Daleks, and rare clips from programmes like Vision On and Whicker's World. Personally, I'd be much, much happier if these items were accessible as standalone features, too. Chop them up and mess around with them to your heart's content in the body of a documentary if you must, but please, let's also have them intact (and in their original full-frame 4:3 format), too. Continuity Compilation is a six-minute collection of BBC continuity announcements and trailers, from the story's original transmission, and its subsequent repeats. It's rather nerdy, which is why previously these have been squirreled away as Easter Eggs. Here, though, there are so many that they provide a nice demonstration of how these announcements have been handled over the last three decades. The disc's seven-minute Blue Peter segment was transmitted during Genesis of the Daleks' original run, and features John Noakes and Peter Purves showing off a collection of fan-made Doctor Who models (somewhat oddly, without their creator, Jonathan Sellars). The segment is rounded-off, for no apparently good reason, with a lengthy clip from the Jon Pertwee Doctor Who story Death To The Daleks. It's interesting to note that future Doctor Who director Sarah Hellings is credited as one of the Production Team for the show! The Photo Gallery (7m) offers a comprehensive slideshow of photo's from the series, set to sound effects from the show. In lieu of any behind-the-scenes footage from the story (none is known to exist), there are a few revealing shots taken during rehearsals here. There are also photographs from a couple of official photocalls, including the famous one of Tom Baker and the Genesis Daleks at TV Centre. Finally, there are two PDF files on the disc, which offer material via your DVD-ROM drive. The first is a collection of Radio Times Billings, which collects together the original 1975 clippings, including a short article featuring interviews with Tom Baker and Terry Nation, and one for the Christmas 1975 repeat, which is illustrated by a classic piece of Frank Bellamy artwork. Oddly, though, listings for the 1982, 1993 and 2000 repeats are not included. The second PDF file features the 1976 Doctor Who Annual, the first to feature Baker as the Doctor. It's beautifully presented (these aren't simple scans - you can also cut-and-copy the text, or have it read aloud, if you're so inclined). The 1976 annual is bizarre, even by World Distributor's warped standards, with some of the most unappealing, and often downright baffling, art you can imagine. Still, there's some fun to be had figuring out which illustrations have been adapted from photo's (they're not always Doctor Who photo's!) Although the annual isn't particularly difficult to get hold of, or expensive, this is a very nice addition to the disc. Hopefully some of the earlier, much rarer, annuals will be added to forthcoming Hartnell and Troughton DVDs. One or two lacklustre elements aside, there's plenty to enjoy on this two-disc set, which has been pitched to appeal to fans old and new. 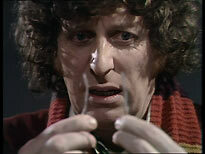 The story is one of the very best Doctor Who stories, and it has the Daleks and Tom Baker in it. What more do you want! The episodes have been expertly re-mastered and transferred to disc, and have never looked better. The bonus documentaries cover all the bases, providing solid information to casual viewers, and a treat or three for more dedicated fans. All this for less cash than you'd pay for some bare-bones Hollywood blockbusters. Exterminate!